This idea has been swirling inside my head for a while. 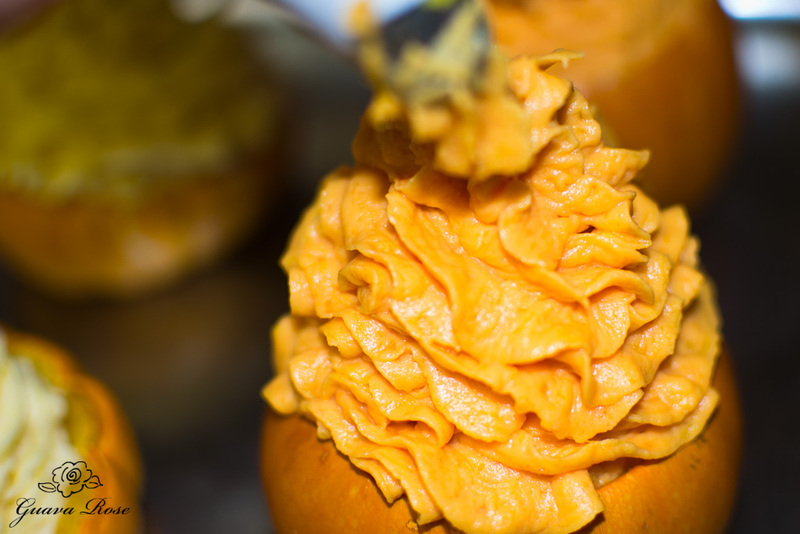 Pumpkin and sweet potatoes whipped together and piped into mini pumpkin shells. Piped high to look like soft serve ice cream, but packed with nutrients and just a touch a sweetness. 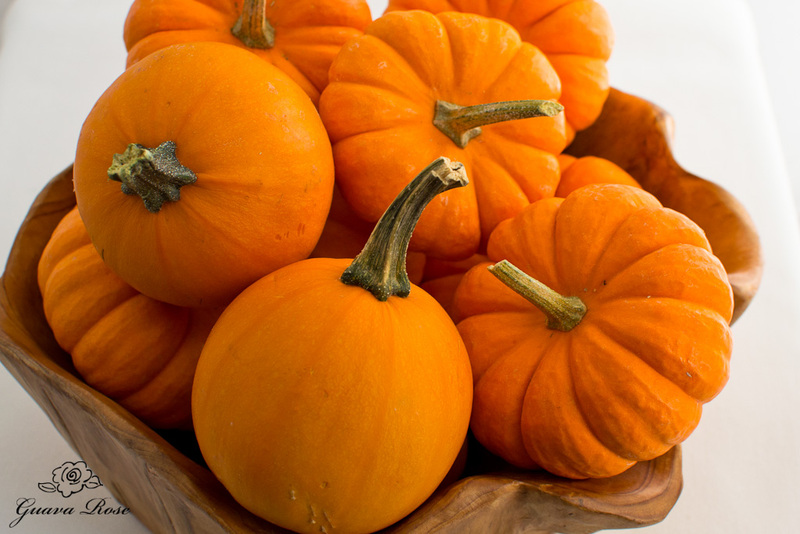 This time of year, the markets are filled with all sorts of enticing squash and pumpkins. It’s hard not to just stand there for a few minutes and admire all the displays and the colors of fall. I chose the standard mini pumpkins, which are the shorter, squat pumpkins, and something new called the Wee Bee pumpkin. The Wee Bees are so cute–they’re round and about the size of a softball. 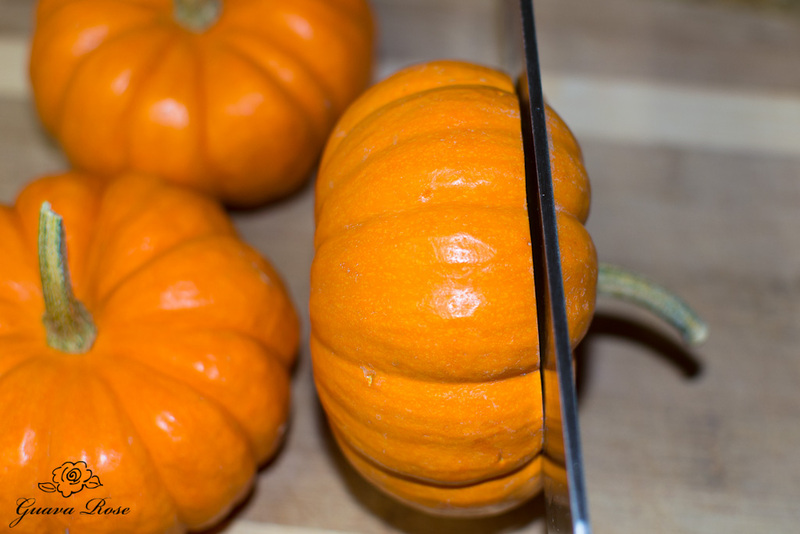 After washing and drying the pumpkins, cut the tops off about one quarter to one third of the way down. Be very careful, as sometimes the pumpkins can be very hard. Use a sharp knife and keep your fingers curved inward. 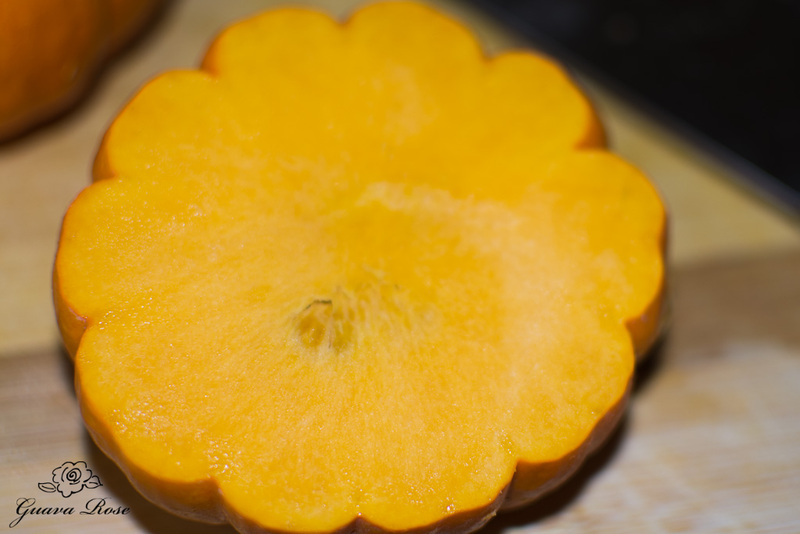 Sometimes when you cut the top off, you’ll have barely reached the inside hole with the seeds. 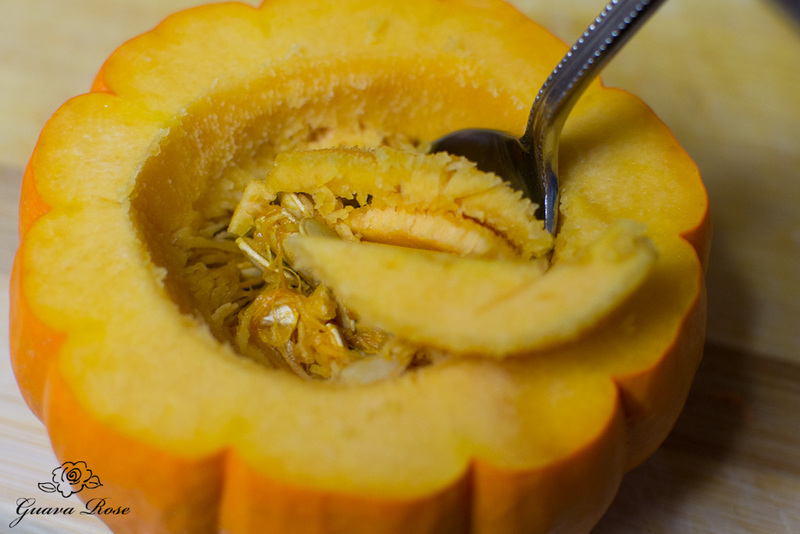 Use a teaspoon to poke through to the center and get to the seeds. It’s pretty easy to use the teaspoon to cut through the flesh and widen the opening. 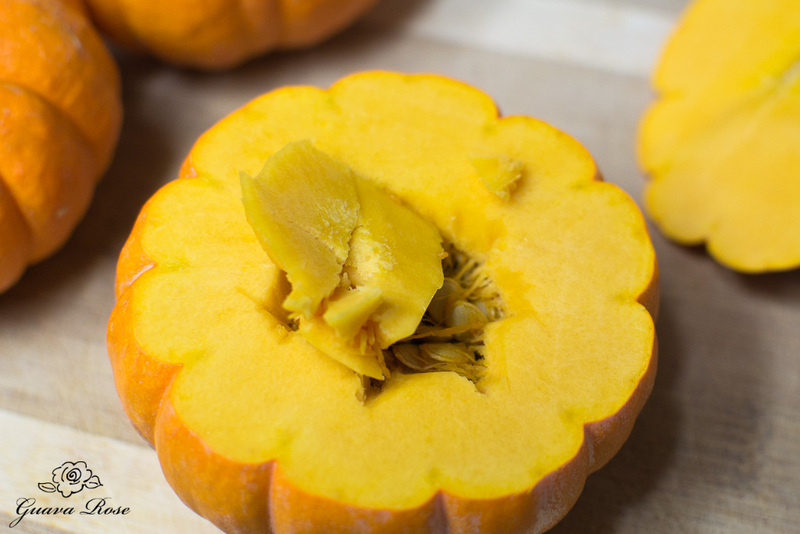 Leave 3/8″ to 1/2″ of pumpkin around the edges, and scoop out all the seeds and fibrous material. Rinse them out and place on a baking sheet. Bake at 350 degrees for about 25 minutes until they’re just starting to soften. I like to flip them over about midway through so they cook more evenly. Here’s a picture of the Wee Bee pumpkin. I have to say that although they were cute, they were much more difficult to work with. A lot of them were a little green, as you can see, which is probably why they were so hard to cut open. With the extra round shape and the extreme hardness, I think they are really a bit too dangerous to use often, or to cut multiples of. Of note, I did put it in the microwave for a minute on high after making an initial slit on top, and it softened just a tad to make it only a fraction easier to cut through. 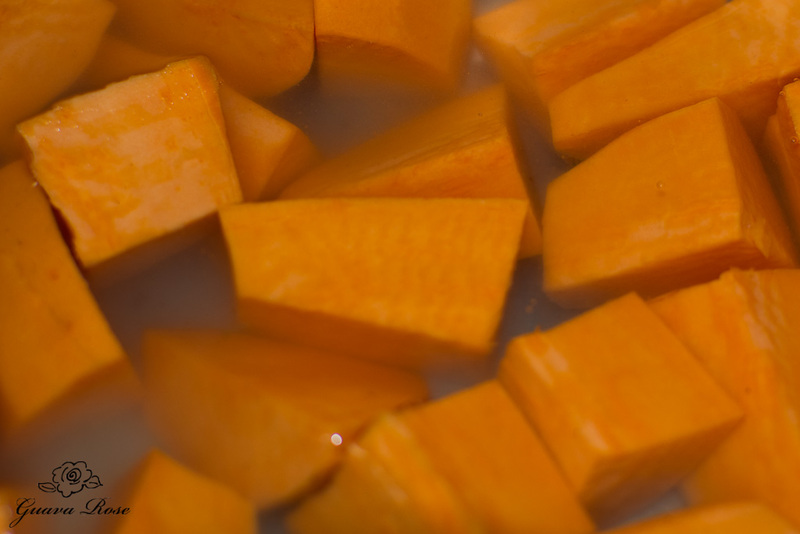 Peel a couple of pounds of sweet potatoes and cut them into 1-1/2″ chunks. Boil until soft, and drain well. Mash well with a couple of tablespoons of butter. It’s important to get it really, really smooth here so that the mixture doesn’t clog the piping tip when you pipe it into the pumpkin shells. 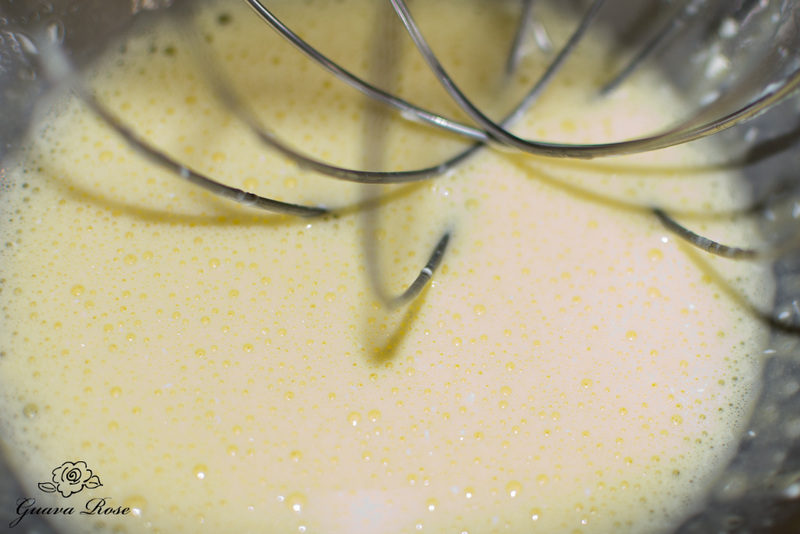 In a standing mixer, whip together eggs, reduced fat cream cheese, maple syrup and vanilla extract. Add the mashed sweet potatoes and beat together for 30 seconds. The mixture will lighten slightly in color and look fluffier. Don’t beat the mixture any longer, or it may have a heavier, gummier texture later. 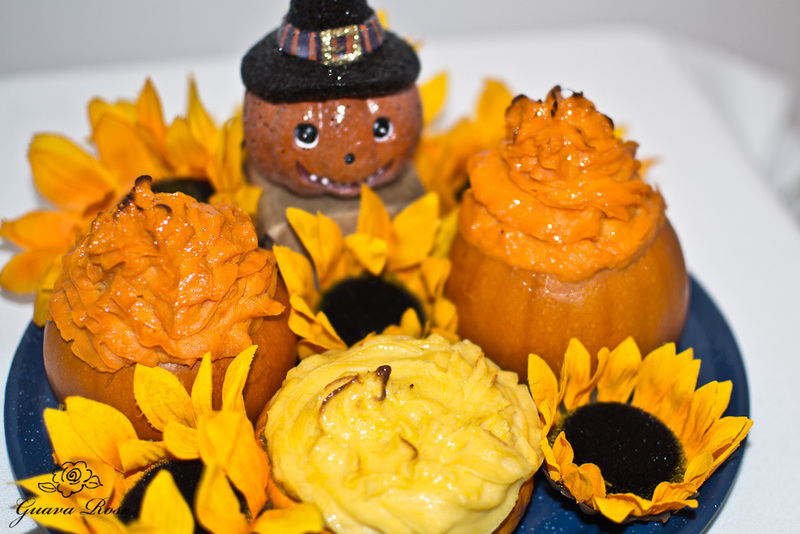 Use a pastry bag with a large star tip to pipe the filling into the now softened pumpkin shells. 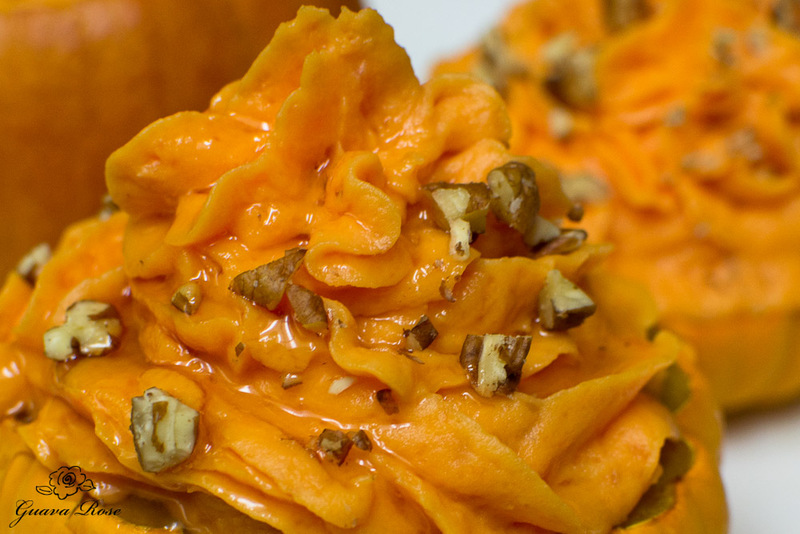 To save my hands from “piping fatigue,” I cheat and use a spoon to scoop the filling into the pumpkin shells up to the rim, then I just pipe the filling on top. Saves a bit of time also. 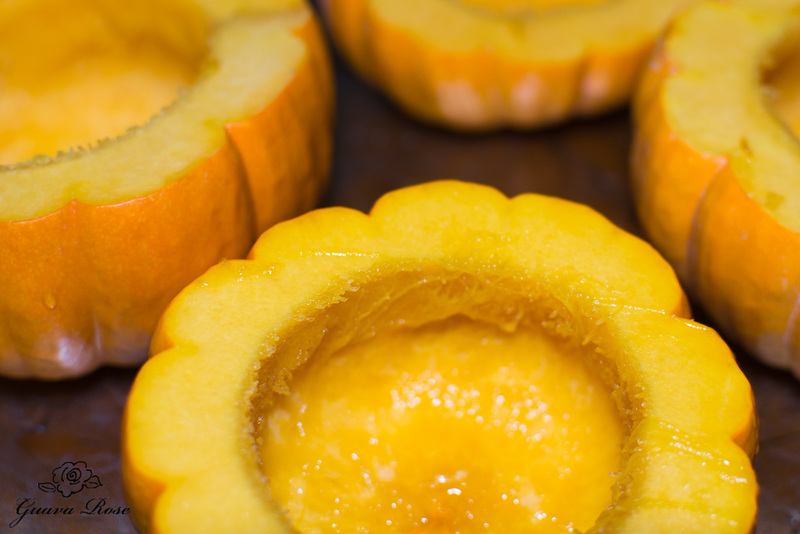 Bake the filled pumpkins at 350 degrees for another 20 minutes or so until the filling is heated through. Earlier this week, we enjoyed some on Halloween. The one in the middle actually has my twice baked potato filling with some of the cooked pumpkin scraped out, pureed, and mixed in. It was good. In fact, initially I scraped some of the cooked pumpkin out of the shells, pureed it, and then mixed it in with the sweet potato filling. It was good too, but really just created a lot of extra work. I was trying not to waste the pumpkin, but it’s simpler to merely scoop some of the cooked pumpkin as you eat the filling. 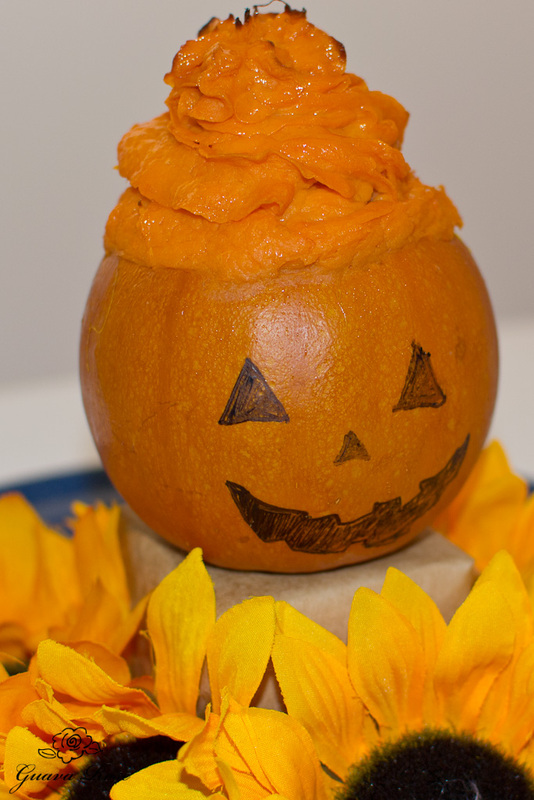 You can use a black food color pen to draw a Jack-o-lantern face after it’s cooked and cooled a bit. I improvised and used a black sharpie pen (just make sure no one eats the skin). I love the look of the piped filling. They remind me of frosting on cupcakes! I’ve made these quite a few times. The many varieties of pumpkins and sweet potatoes produce varying shades of orange, but they are all vibrant and beautiful. So if you’ve been noticing the different colors of pumpkins and filling in the photos, that’s the reason why. 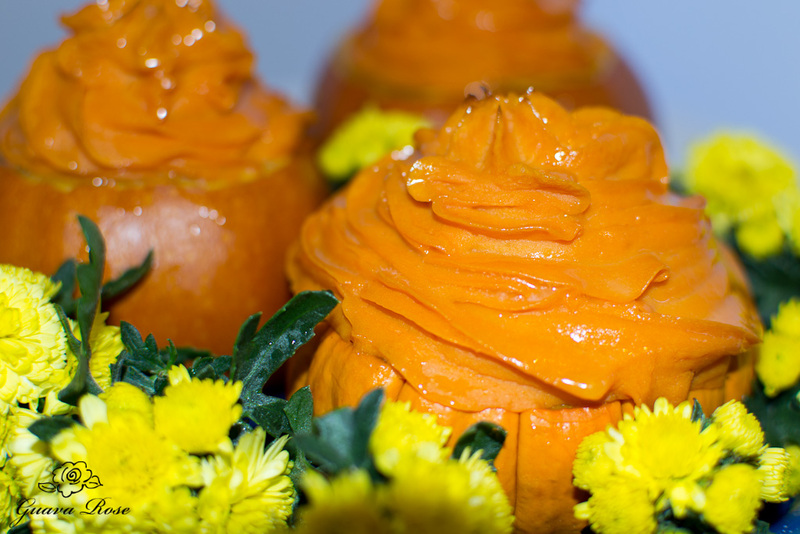 Don’t want to go through the trouble of doing the mini pumpkins? Just pipe or spoon the filling into greased custard cups and bake. Chopped pecans add a nice little crunch to the top. Press a spoonful on before baking. Half of my crew likes this with just a touch of sweetness as it is, and the others like it sweeter. The solution? Serve extra, warm maple syrup on the side! Now that looks like it could be dessert! Cut the tops of the pumpkins off, one quarter to one third of the way down. Use a teaspoon to remove the seeds and fiber, and to widen the opening. Leave ⅜"-1/2" of flesh around the edges. Rinse out and place on baking sheet. 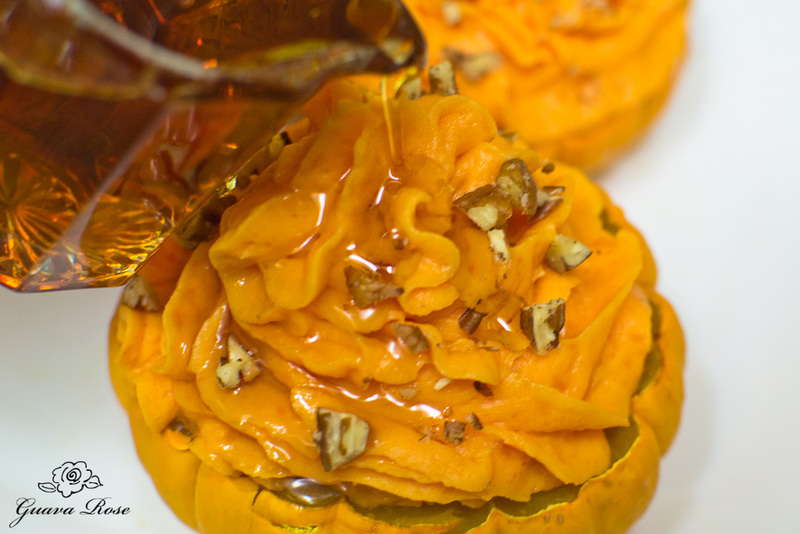 Bake at 350 degrees for 20-25 minutes, until pumpkins are just starting to soften. Remove from oven. Peel sweet potatoes. Cut into 1-1/2" chunks. Cover with water in a pot and boil until tender. Drain well. Mash well with butter, until extremely smooth. In a standing mixer, mix together cream cheese, eggs, maple syrup and vanilla on medium until blended. Increase speed to high for 1 minute. 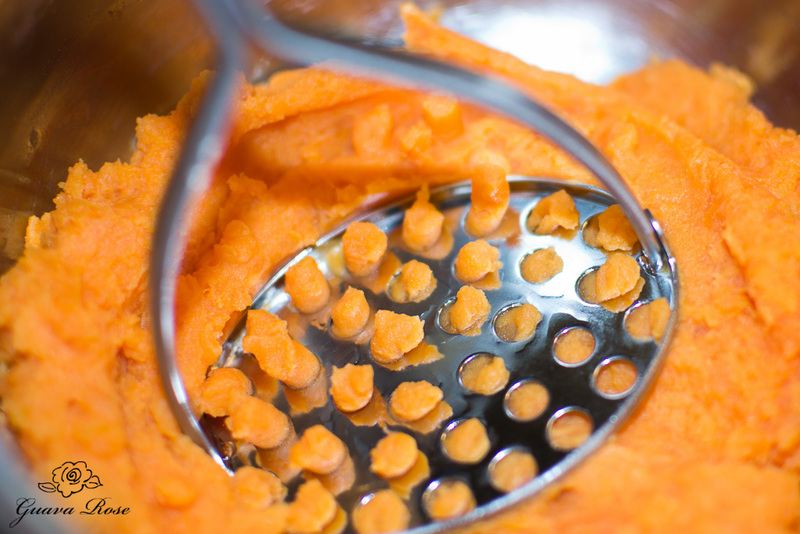 Turn off mixer and add mashed sweet potatoes. Mix on medium for 30 seconds, no more or mixture may be heavy and gummy later. The filling will look lighter in color, and fluffier. Put some filling in a pastry bag that has a large star tip inserted. 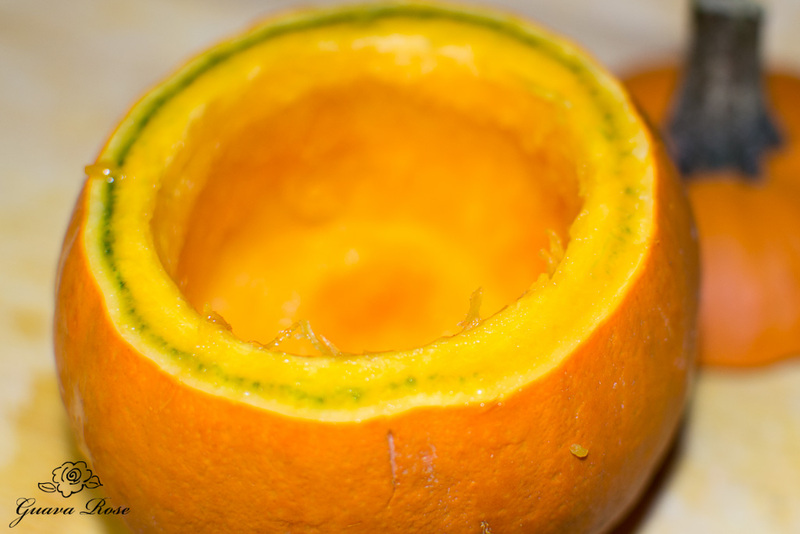 Pipe filling into pumpkin shells. Repeat with the remaining filling and pumpkin shells. Sprinkle and lightly press in 1 tsp. 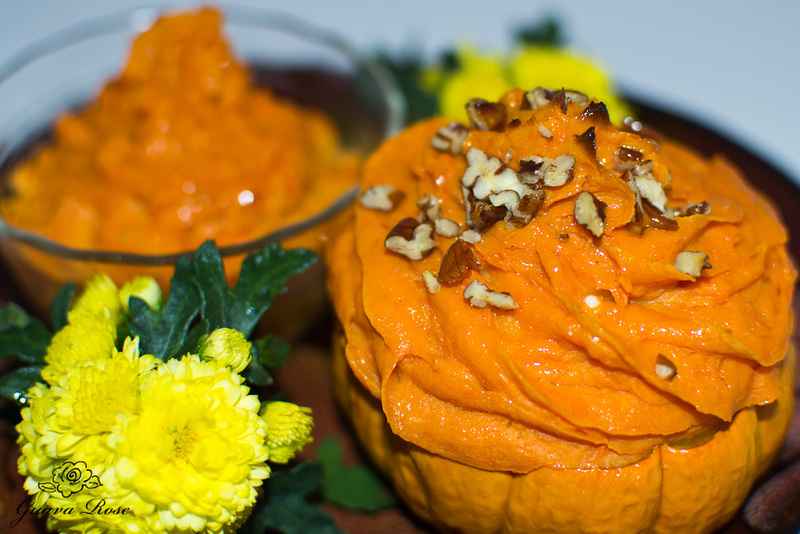 chopped pecans onto the top of each pumpkin if desired. Bake at 350 degrees for approximately 20 minutes, until filling is heated through. Serve with warm maple syrup on the side if desired.